Save time and money! Arlington’s low-cost MC cable fittings, for dry locations only, are super-convenient and cost-effective. 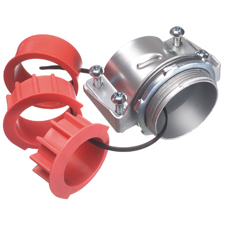 They have a built-in end stop and come with additional end stop bushings that vary the size of the opening. ONE trade size fits several cable sizes! Changing end stop bushings is fast and easy. There's no need to remove the strap. Simply loosen the screws and insert the bushing that works the best with the cables you’re installing. *Size the bushing to the cable bundle, not the metal jacket. Cost Much Less than steel or malleable iron fittings.